You can't move for Red Dwarf anniversaries at the moment. 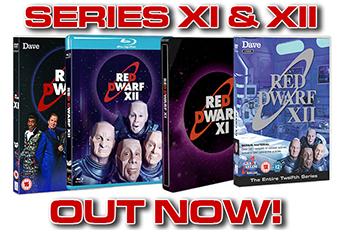 But while we celebrated the 30th anniversary of the show debuting back in February, and then the same landmark for Series II earlier this month, we're now turning our attention to something that happened five years later: the launch of 1993's Series VI. Yes, Psirens first aired on BBC2 on 7th October 1993, which means we're just about to hit the silver anniversary of the sixth series - and frankly, we thought that was worth celebrating just as much as the other big anniversaries of 2018. It's fair to say that Red Dwarf V was some act to follow. It was the series that was running while the show was at its merchandising height - and being followed on a monthly basis by the Smegazine - and what's more, it ended with Back to Reality, an episode that was immediately marked out as an all-time-great. The sixth series would need to be sure-footed indeed to live up to the ever-heightened expectations. Rob and Doug had returned from Hollywood smarting from the Red Dwarf USA experience - but with valuable lessons learned about a different style of sitcom making. As such, Series VI was never going to simply be a repeat of everything that had made Series V successful. 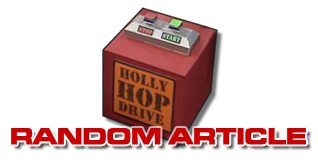 Instead came a stylistic change arguably as big as the one between Series II and III, with the titular ship jettisoned in favour of claustrophobic, Starbug-bound weekly adventures; and for the first time, a character who had been with the show since the beginning was written out, with the writers judging that Holly and Kryten were jostling too much for screentime, and deciding to leave out the former. The new premise, with the crew hunting down Red Dwarf, gave the show a fresh impetus, while the cockpit and midsection-bound scenes gave plenty of opportunity for character comedy and a new style of running gags - bringing us in the process the classic recurring trope of the Space Corps Directives. But if anyone thought this would lead to a formulaic series, they were mistaken - with ever-more-outlandish concepts explored, including an episode that would shake to the core what we thought about the characters. The biggest hurdle in making the series, though, was the time constraint placed upon production, with the BBC requesting that the episodes - which were filmed in February and March 1993 - be ready for a Spring or Summer broadcast that same year. Having succeeded in meeting this deadline, the team were then told that the broadcast would be delayed until the Autumn - a fact that meant that, in a situation that would surely never happen in the internet spoilers age, the script for Psirens was published in the Primordial Soup script book months before the finished product was broadcast! Script book spoilers or no, that first episode faced the challenge of reintroducing audiences to the show, capitalising on the recent years' surge of interest by offering a fresh jumping-on point. 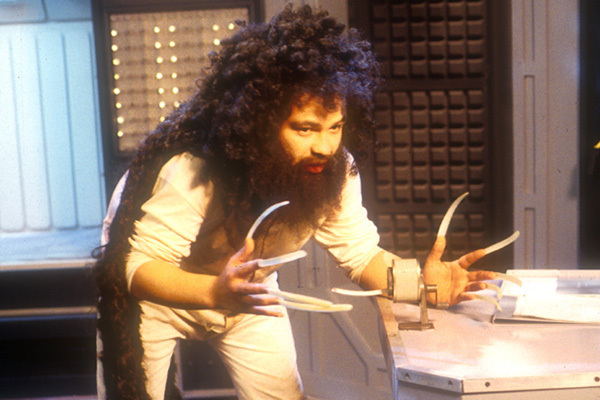 In the shape of Jenny Agutter, meanwhile, it showed that the sixth series was still capable of attracting the high-calibre guest stars the previous ones had done. In Legion, another part of the show's premise was changed forever, as Rimmer was granted his hard light drive - restoring his physical presence for the first time since he was killed. After five years stuck as an intangible hologram, giving him this presence reduced the possibility of being stuck in narrative corners or requiring complicated workarounds - but the fact that he was now in an essentially immortal body could still also be mined for humour, as we would see later in the series. Legion was also a particularly strong showcase for the new series' hugely increased, rapid-fire gag rate - with an extended cockpit sequence including the famous "Blue Alert bulb" joke that simply never lets up in terms of jokes (and a gag involving another light switch later in the episode that's almost as good). 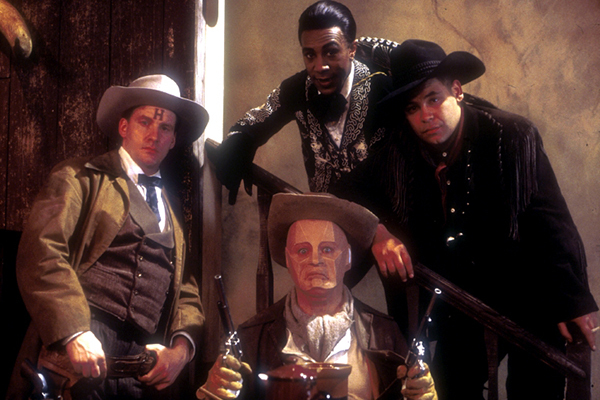 It was Gunmen of the Apocalypse, though, that showed what Red Dwarf circa 1993 was truly capable of. Location filming at the mock Western town of Laredo produced an episode unlike any ever before - and one that not only struck a chord with fans, but also saw the show win a prestigious International Emmy award on the strength of it. When a show like Red Dwarf hits as many as six series in, it's an unavoidable fact that it develops a "lore" - and aside from being fodder for endless fan discussion, this also gives a rich seam of material to go back to and re-explore. Rather than simply doing a sequel to one episode, however, Emohawk: Polymorph II picked up concepts and characters from not one, not two, but three prior episodes - Polymorph, Dimension Jump and Back to Reality. That the resultant episode was not only a coherent one but also added to the show's ongoing mythology in the shape of the creation of the GELF race, was remarkable. Rimmerworld was a story that wouldn't previously have been possible with the soft-light-only version of Rimmer - which leads us to ponder a terrifying alternate universe in which the magnificent "Or we could just use the teleporter" gag doesn't exist. Furthermore, the episode introduces the show's first ever piece of episode-to-episode continuity, as the closing joke was edited to become a direct lead-in to the series' finale. Finally, Out of Time - retitled from Present From The Future - was aptly named, as the time pressures on the production of Series VI were at their most acute, with scenes from the episode being rewritten on the fly during filming. Perhaps this contributed to the uniquely tense and foreboding atmosphere that hangs over the episode, which opens up the possibility of our beloved characters becoming evil several years down the line. The cliffhanger that ended the series, meanwhile, was a late addition that ended up proving even more resonant when there was a gap of four years between the sixth and seventh series. During that interim, the originally intended ending would be featured on the Smeg Ups tape, as the first example of a deleted scene rarity from the show being made public. 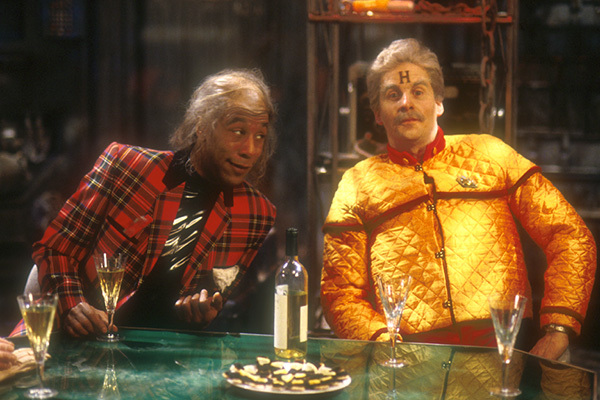 Red Dwarf has always strived to strike the balance between strong sci-fi stories and humour, and in Series VI that goal is achieved with energy and verve. The series has a look and feel all of its own, and despite the production pressures, exudes confidence. 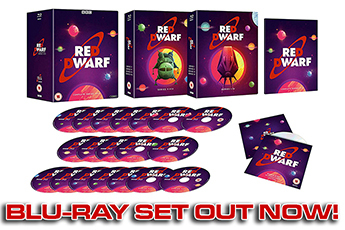 In the process, we get some of the show's most fondly-remembered jokes and visuals - and, in the shape of that Emmy award, the proudest piece of international recognition and acclaim Red Dwarf had ever received. 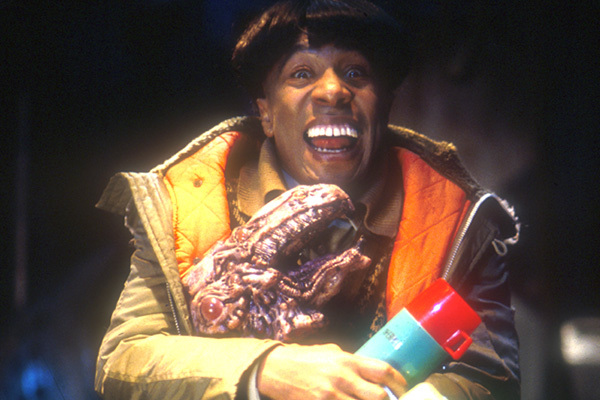 Twenty-five years on, Red Dwarf VI still stands up as a truly classic series.